I can't get it to work on my PC. Anyone else? Definitely let me know if anyone has figured out the PC key strokes and I'll add that! I've just received the book ! Thank you so much !! It's amazing ! Nothing like new skills. Thanks! By far the coolest thing that will happen to me this week. Thanks! I'm so glad you all like my Skullicon Skull Smiley. I can't help but think that resorting to extended ASCII sequences is overkill. 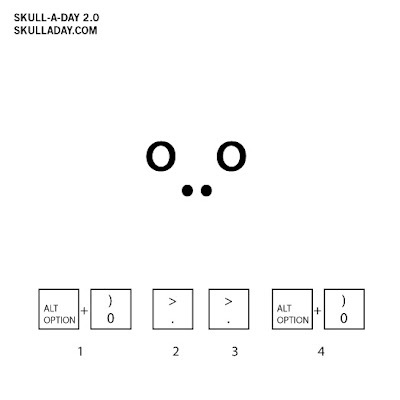 I tried so many ways to make a little skull. There are lots of methods to be found all over the interwebs, but I thought that simple version was quick and to the point for a chat. hmmm...cutting and pasting worked, but the keystrokes didn't.